Vaazhaikkai Puttu is one of my favourite dry curries. The normal dry curry or poriyal made out of raw bananas would need more roasting to make it tastier. This dish is made of cooked and grated raw bananas. Till today I believe my mother makes it the best. This puttu can also be made with very less oil. Though I didn’t know the concept of less oil when I was little, I think the taste of dal and chillies in the seasoning must have made this more appealing. In the dry curries, seasoning in terms of oil, mustard seeds and dal is generally not poured on top at the end. The recipe starts with oil, mustard seeds and dal, continued with curry leaves, green chillies or red chillies as per the dish. This is more or less common in all poriyals or dry curries. So, keep checking in between! Use a metal ladle – when the poriyal is mixed in the pan, the grated vegetable remains like grated coconut. 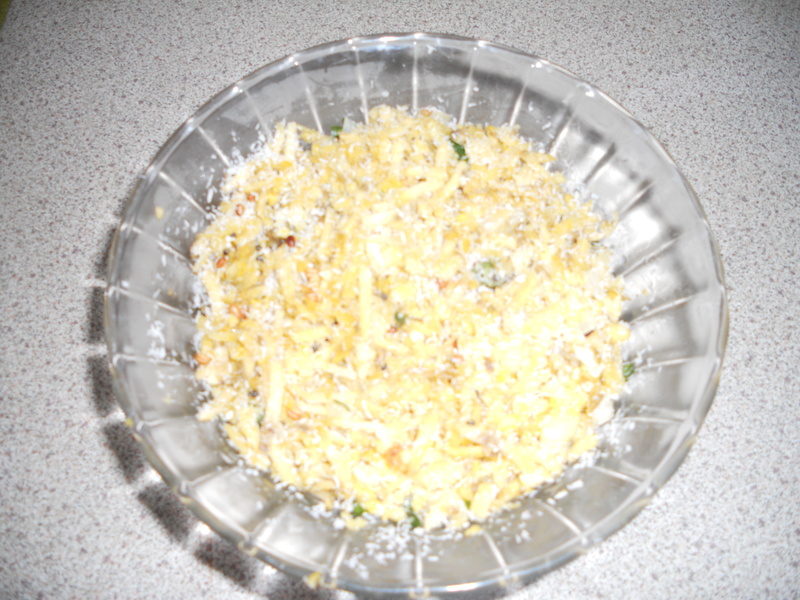 Sprinkle freshly grated coconut before serving. Note: Sorry, the above photo is not clear enough. Photo of grated raw banana and a better photo of vaazhaikkai puttu would follow.